Fargo is from Bensonhurst, Brooklyn. He started writing in 1973, at the Coney Island yard, behind John Dewey H.S.. It was actually a smaller yard called Stillwell yard but part of the larger Coney Island yard complex, back in those days the yard was only 10 tracks, but has since grown to 30 tracks. Fargo was with one of his earliest partners, a writer named Part 2, who was already up. He knew him from nearby Marlboro projects, so he took Fargo to the yard, where he did his first piece; pink fill in, black outline, then reversed the colors and did another one…. He was hooked!!! Some of the earliest writers Fargo remembers seeing were, Agee 170, Jace 2, Cliff 159, FDT 56, Clyde & Flint 707. Flint 707 was the writer that influenced him; his work wasn’t just outside the box, he pieced like there was no box. Fargo got his name from all places….an armored truck. Then came Skylab 2, Base 353, Jam 1 and Rob 131 and a whole litany of aliases, 2 many to name!!! Fargo left the trains in 1976, I wasn’t trying to keep up the younger cats getting up, with the arrival of throw-ups, he wasn’t into it anymore, funny thing is the bug never left. Once a junkie always a junkie!!! 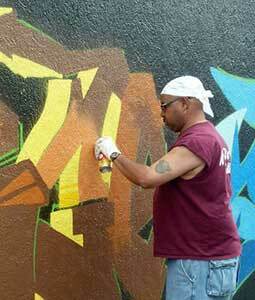 Since returning into the graffiti culture, he got down with, TPA, the Public animals, X-Men & The Cool 5ive.